Pink (yes, pink) Vieo has been installed as a unique saw tooth-shaped roof feature with a colour-matched entranceway on the new Arts University Bournemouth (AUB) Building in Wallisdown, Poole. 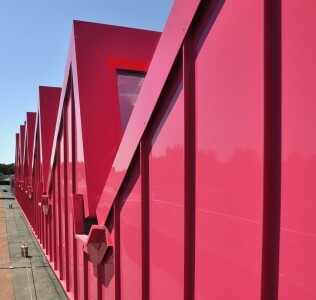 The building exterior, along with the elements that make use of the unusually-coloured Vieo system, is sure to become a design icon and inspire students to embrace their inner creativity. Main contractor Morgan Sindall employs around 5,700 people, working on everything from small scale fit outs and utilities projects to major urban regeneration schemes. Their strength comes from this balance of activity, combined with their ability to provide integrated solutions. Morgan Sindall are able to further leverage this strength by developing key supply chain partnerships with industry-leading construction specialists, such as Coverworld Construction and Euroclad. According to a recent article in the Guardian online (1 January 2017) the UK’s creative industries contributes “almost £90bn net to GDP; it accounts for one in 11 jobs, a rate rising more quickly than all other parts of the economy.” This means that educational facilities specialising in developing the skills required by the creative industries are increasingly important to the culture and economy of the UK. And the construction of functional, attractive buildings such as the AUB is critical to creating a learning environment that is effective on a practical level, whilst inspiring creativity through the use of impactful visual design.